The University Mall is located at 1235 East Main Street in Carbondale, Illinois. The mall currently has a high vacancy rate (4 of its 10 store anchors are vacant and some parts inside the mall are almost completely deserted). The first business to open on site was JCPenney in 1971. At the time the mall itself was in its planning stage and would not officially open as a mall until 1974. When the mall first opened it featured a new Sears and the JCPenney mentioned above. 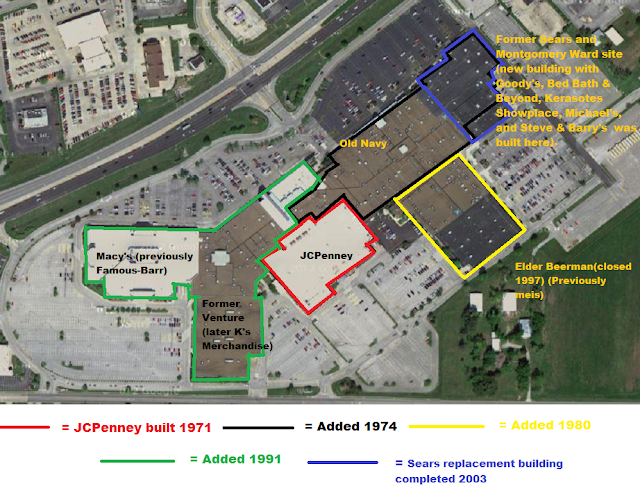 The enclosed mall comprised then of one wing of stores that started at the northeast corner of JCPenney and ended at the southwest side of Sears. In 1980 a wing connecting to the southeast of the mall was built and a new Anchor opened there called Meis. Meis would be re-branded as Elder Beerman in 1989. In the spring of 1991 a major expansion opened at the University Mall. This expansion came with a price-tag of $35 Million. Included in the expansion was the addition of a food court, a Venture store, a FamousBarr store, and more enclosed mall space. In July 1991 Sears relocated to the Illinois Centre Mall that was developed approximately 20 miles away in the city of Marion. Here are some photos of the Illinois Centre Mall. In 1992 Montgomery Ward set up shop in the former Sears building. The 80,000 square foot Venture store was shuttered in February 1993. On November 9th, 1995 K's Merchandise opened in the former Venture store. The mall's Elder Beerman store closed in 1997; this store is currently occupied by Southern Illinois Healthcare center. In 2001 the mall's Montgomery Ward store closed along with all other remaining Montgomery Ward stores. In May 2002 an Old Navy store opened in a section of the mall that previously housed smaller shops. In July 2002 demolition began on the former Sears and Montgomery Ward store. In 2003 a new addition to the mall opened there. In 2004 the food court was moved to an empty area by the former Meis and Elder Beerman store. In 2006 Famous Barr was re-branded as Macy's. K's Merchandise and Michael's were shuttered within the first few months of 2007. Also in 2007 plans for a small strip plaza on the northwest side of the mall were cancelled. As mentioned in the list above, the Steve & Barry's and Goody's stores closed in 2008. A site plan I made with Google Maps imagery. Here are some photos of the University Mall from May 19, 2012, enjoy! The former Venture/ K's Merchandise mall entrance. The former Elder Beerman is straight ahead and the Food Court is to the left. You forgot to mention that 6 new stores opened this year at University Mall. I remember when I was a kid I for some reason loved the escalator that was in the Sears when it was there. It was a great mall for a couple of brief periods of time. I remember the escalator! They have a ross now its amazing! Wetseal hollister buckle journeys kays macys bath and body works bed bath beyond rue 21 romancing the stonw. ..So glad there is finally someone to give those Sterling company stores (Jared, Kay, JB Robinson, all the same company..same products at different price points) a run for their money! What is AMC Showplace? Is it just another name for the movie theater or did it have other stuff there. Do they actually have tenants in the food court? Clearly there werent any when I visited. They filled an anchor with a medical building, and the venture space is still empty. The Goodys was sitting empty, and the Elder Beermen wing was 100% empty, as was the old Steve and Barrys. So did things suddenly turn around? I heard that they have other plans for the food court area.....also was told that two new stores are going in the old Goodys location this year. There is no Elder Beerman in the mall but a new computer lounge or something opened by the food court area. The old Steve and Barrys is a hugh shoe store now. Sounds to me like things turned around and still are. I guess now there is some hope; I've read plenty (on this page and other sources) of many new stores that are either at or on their way to University Mall. Whenever I've gone there it's been quite busy, so how could this mall be "dead or dying"? That's still rather silly. The mall in Marion (Illinois Star Centre) is the real definition of "dead or dying"; that place is a ghost town. You said it yourself. Stores leaving for "whatever reason" despite it being a college town. This shouldnt be happening. A complete joke of a food court doesnt help either. Foot Locker is usually the last one in dead malls, so when its one of the first to leave, thats a BAD sign. Well living in this town for almost one year, this "mall" is a joke. I'll be allot happier when I move back to Chicago! You know a mall/town is bad when you only get 1 inch of snow on ground and everything shuts down. If it was not for the collage this God forsaken town would be non existent. To Anonymous; This mall in NOT a joke and maybe you should go back to Chicago. Comparing a mall in a smaller town of only about 25,000 plus college students(when they are in town) is not the same as Chicago!! I have lived in southern Illinois all my life and we DO NOT shut down everything with only a 1 inch snow on the ground. To bad you are not non-existent! I'm sure many of us also will be a lot happier when you move back to Chicago. Be sure and take the negative attitude with you. It has seen better days but I don't get why its on dead and dying retail. There are still a lot of stores. I just visited a great place for my kids to play in the mall that just opened called Kidz Play Zone. Great Place! When there are no food places, its a dead Mall. Okay, so move back to Chicago. I am from Chicago too and am happy to be away from it. Another former large tenant in the University Mall was Alongi's Italian Restaurant. It operated in the area across from the main entrance of JC Penney into the mall (what is now Maurices and part of Rue 21, sections 45, 46, and 47 on the directory map), in the general area of the old food court. The restaurant was owned by a local family, who also own the Alongi's restaurant in Duquoin, IL. If I remember correctly, the restaurant had two floors and an open design (so that people walking through the mall could see into the restaurant). The University Mall location opened in late 2004 and closed in December of 2007, though the Duquoin, IL location still remains. The old Garfield's Pub, which occupied section 55, closed June 22 2014 and became S&B’s Burger Joint. Also, the current large tenants include: Macy's (in section 56 on the map from May 19, 2012 seen towards the top of the page), JCPenny (section 67), Old Navy (section 39), Shoe Dept (Section 10, the old Steve and Barry's), Showplace 8 Theatre (section 21), Bed Bath and Beyond (section 22), Ross Dress for Less (section 23, the old Micheal's), the Breast Cancer Center (the new section 85, combination of the old sections 87, 88, 89 and 91), the Science Center (section 62), and Southern Illinois Healthcare (section 89, the old Elder Beerman). I miss the water fountain that used to be in this mall. You could hear it all through the mall. Had a soothing sound and the fountain was a great meeting place. I guess the thing became to expensive to maintain. I think JC Penny and Kirlins are the only stores still open that were in the mall when it opened in 1974. I might be wrong about Kirlins though. Does anyone know when the Woolworth store opened and closed in the Mall? Thanks! I used to work in this mall back in 2000 at Babbage's then Famous Barr (now Macy's) & to see how for downhill this mall has fallen is just sad! I used to work in this mall back in 2000 & 2001. First at Babbage's, then a Record Store, then Famous-Barr (now known as Macy's) This mall had alot of energy & to see how far downhill it has fallen is just sad!